At the historic Gendarmenmarkt square in Berlin, hundreds of pro-European protesters gathered on Sunday. They were holding European flags and anti-Brexit banners while voicing their support for the European Union. Several Bundestag parties, the liberal FDP, the conservative CDU, the center-left SPD, the leftist Greens and the ultra-leftist ‘Die Linke’ were part of the event. So were prominent figures from the European Parliament in Brussels. On a rainy Sunday in Berlin, the turnout was rather modest, with around 600 participants, but those who came seemed very determined. 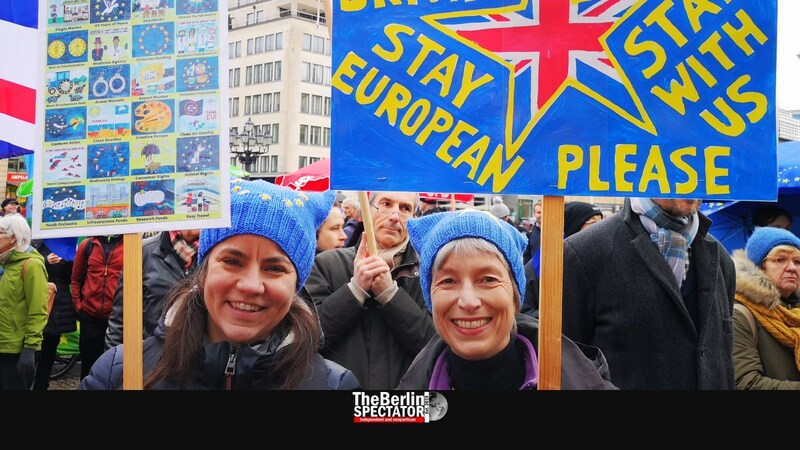 One lady held a sign saying “Stay British, stay European please, stay with us”, another protester held one listing “24 reasons to remain in the E.U.”. On stage, speeches and music were delivered. The British pro-E.U. activist Madeleina Kay sang a few pro-European songs she had composed. The European Commissioner for Competition, Margrethe Vestager, came to Berlin in order to be part of the rally. She stressed the democratic values Europe stood for. The idea of the European Union, which had brought peace to all, needed to be defended against right-wing populists. Guy Verhofstadt, leader of the liberal ALDE parliamentary group at the European Parliament, slammed the Brexit approach. “It is stupid to leave Europe” he said. Pulse, the alliance for Europe, needed to continue fighting every day, week, month and year. That way, the European dream would succeed. Verhofstadt mentioned Holocaust Memorial Day, which was observed today in many countries, saying populists and nationalists had brought war to Europe in the 19th and the 20th century. They needed to be kept from doing so again today. More pro-European rallies will be taking place in Darmstadt and other German towns in the coming days. The European elections are scheduled to take place from May 23rd to 26th, 2019. Pulse of Europe wants to make sure as many voters as possible understand what it is really about.